Our Car Wash Detergents & all our locations… Blendco’s patented SuperSat Custom Detergent System is an ingenious two-component detergent process that delivers powerful cleaning performance. The SuperSat unit automatically mixes our specially formulated detergents on-site using our water. The SuperSat system allows detergents to be tailored specifically to suit the needs of our wash. SuperSat is a detergent process like no other because it can deliver 100% active ingredients without the need for fillers, binders or water to keep often incompatible detergent ingredients in solution. By using a powerful alkaline component and a liquid surface component, and by keeping them separate until they are automatically mixed with water at our wash, SuperSat is able to offer outstanding cleaning power safely and economically. Because the technology allows for the use of high concentrations of gentle cleaning ingredients (much higher than traditional formulated products), SuperSat does not rely on harsh chemical ingredients for cleaning. Instead, large quantities of the best proven alkaline cleaners can be applied to vehicles economically, allowing the detergent to clean gently and effectively. Saving Water… when we make spot free water, which is R/O reverse osmosis we store that water in a 1500 gallon tank. For every gallon of spot free water that any car wash makes you discharge one to two gallons away in the sewer. That discharge water is still soft and great for washing. We here at Hub City Car Wash save that water and store it in a 1000 gallon tank and use it for our under carriage and wheel washers in our automatics. 1000 gallons of spot free water production returns us 1200 gallons of clean, soft water that can wash over 40 cars. Remember spot free wash is always in use in the final rinse of any of our four washes, which means spot free is in constant production. Energy efficient lighting… Hub City Car Wash & Creston Car Wash are switching over to all CFLs to provide more lighting and also save energy in our going green company vision. CFLs are four times more efficient and last up to 10 times longer than incandescent. A 22 watt CFL has about the same light output as a 100 watt incandescent. CFLs use 50 – 80% less energy than incandescent. Washing your car at home vs your local car wash… Washing your car at home usually requires getting out a bucket, turning on the hose, and scrubbing your vehicle, but it is not safe for our environment. Up to 140 gallons of untreated water seep into our waterways and our drinking water supply, as well as creating ecological dead zones. 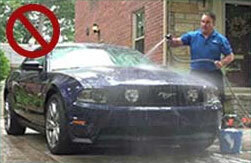 Car washing water must be properly disposed of. Forty-five gallons of water or less is used in the average car wash. Mast have been federally mandated to recycle or reclaim the water for future use. Some of the more ecologically friendly car washes reuse the rinse water several times making it much healthier for the environment. Do it yourself… If you love that hands on washing then the best way is to head to one of our self-service car washes where the runoff water is captured and sent to a water treatment plant. This is often the greenest – and least expensive – option, using about 15 gallons of water. Federal law requires… commercial car wash facilities to drain their waste water into sewer systems, so it gets treated before it is discharged into the great outdoors. 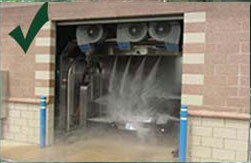 And commercial car washes use computer controlled systems and high pressure nozzles and pumps that minimize water usage. Professional car washes… like us use only sophisticated technology and are specially designed to conserve water. The contaminants are washed off and channeled through sanitation sewers to water treatment plants. Home car washing wastes water, and soap and dirt end up in storm sewers which flow into our lakes, streams and rivers – polluting our environment.